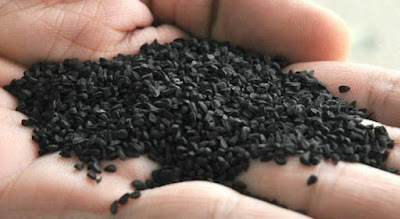 Kalonji contains anti-bacterial, anti-inflammatory and anti-fungal properties. Kalonji paste is beneficial for skin and hair. Kalonji contains nutrients. It contains omega 3 acids, which increase glow of skin. Kalonji contains vitamin B. This increases softness of skin and removes pimples. Kalonji contains vitamin C. This makes skin white and protects from wrinkles. Kalonji contains zinc. This is beneficial for pimples and itching. Kalonji contains calcium, which is beneficial in sun tanning. The mixture of kalonji paste with honey is beneficial to increase glow of skin. The mixture of kalonji, fenugreek paste and coconut water is beneficial to protect hair fall. The mixture of kalonji paste with olive oil is beneficial to remove dead skin. It avoids darkness. Prepare mixture of grind kalonji with mustard oil. It is beneficial to remove dryness of skin. The mixture of lemon juice with kalonji paste is beneficial to cure pimples. Prepare mixture of grind kalonji with cream. Rub it on face as this reduces wrinkles. The mixture of kalonji paste with lemon and cream is beneficial for cracked heels. Prepare mixture of choker with raw milk and kalonji paste. It is beneficial to remove blackheads. The mixture of kalonji paste with yogurt is beneficial to increase shining of hair. Prepare mixture of kalonji with almond powder and milk. It is beneficial to remove spots from skin.